Hi, I am interested in your 1987 BMW M6 Coupe (stock #0488-NSH) listed on Autotrader for $64,995. I'd like to get more information about this vehicle and confirm its availability. 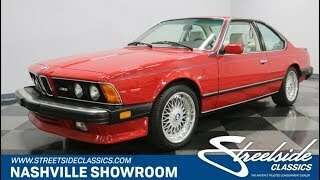 Did you miss out on your chance to buy one of the few 1987 BMW M6s when they were new? Well, now is likely your only opportunity to buy a time machine. This coupe is exceptionally well preserved inside and out, and it has averaged less than 1,500 miles annually. So look over all the details on a truly rare survivor. Youre looking at truly a great moment in history. 1987 was the first model year that BMW brought over its ultra-hot M6 model to the USA. And if youre going to have the fastest BMW around since the M1, theres no better color than Cinnabar Red. This is not only the factory-correct paint, but also its the original red that was applied three decades ago at the Dingolfing factory. The level of gloss and shine you see today is a testament to both the quality work of BMW and how well this M6 has been respected from day one. The same goes for the sheetmeal that retains its precision gaps. And because this is such a great survivor, take some time to look at all the details. The pristine condition of the aggressive chin spoiler, the deep black tone of the rear spoiler, and those iconic cross-spoke alloys look factory fresh. And of course, we love the way the blue pinstripe looks against the red paint, because it matches so well with BMWs M badging. BMW builds cars for drivers, and so their top-of-the-line sports coupe never lets you down. This all-original interior boasts some of the eras most comfortable bucket seats. And even the rear had individual seating and climate controls. Plus, such low mileage means there was little time to even crease the leather. The interior is focused on the driver with the three-spoke factory wheel engineered to give you a clear view at the full gauge package. Plus, the gearstick is exactly where you always want to rest your right hand. And as a premium vehicle, BMWs engineers expertly worked to make sure that it was luxurious without being distracting. You are always just a short reach away from features like the air conditioning, power windows, power lock, the original AM/FM/cassette stereo, and a power sunroof. BMW even offered one of the most advanced power seat controls of the era, and they are functioning perfectly today to still give you that ideal driving position. But what really makes the M6 superior is in the engine bay. The 3.5-liter straight-six is an evolution from the M1 supercar. Not only is this the original motor to the car, but the whole engine bay looks like its not even missing a single decal. This 24-valve, fuel-injected powerplant was built to be the quickest machine around no matter if it was starting from a standstill or approaching triple-digit speeds. And so you can take this from an easy cruising luxury machine to a true performance coupe with just one downshift of the five-speed manual transmission. BMWs Motorsport division engineered the fully independent suspension so that the extra power was kept under optimal control. The same goes for the power steering and four-wheel disc brakes. These M6s were quite rare. As the most expensive BMW at the time, few people were willing to grab the upper echelon of speed and luxury. As a result, less than 1,800 of this entire generation were sent to North America, and this one might just be the finest survivor example. So your choice is call now of miss out forever!